A process is a naturally occurring or designed sequence of changes of properties or attributes of an object or system. The process approach is a management strategy. When managers use a process approach, it means that they manage all the aspects of the processes that make up their organization, the interaction between these processes, and the inputs and outputs that glue these processes together. Primary – Inputs those themselves get transformed, like raw materials. Supporting – Inputs that help in the value addition process. Transforming – Changing in character or culture. Identifying – Separating into smaller and more clearly defined units. Unifying – Combining or bringing together. Homogenizing – Creating uniformity or consistency. Moving – Changing the placing or location. Holding – Keep waiting in a controlled environment. Providing – Giving or offering the requirements. Identify the purpose for which you are working (Mission). Arrive at the path (Quality Policy). Clearly define the objectives of the process. Prepare action plans for achieving the objectives in detail with time bound targets. Decide the method of measuring the results. 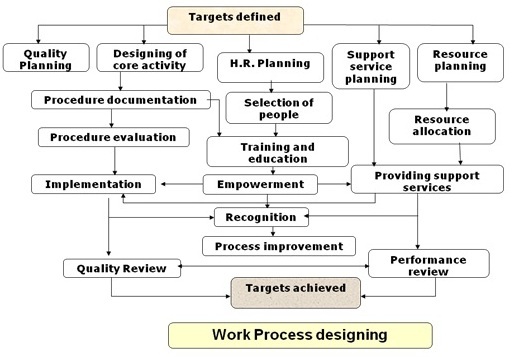 A desired result could be achieved more efficiently when related resources and activities are managed as a process. Start with the Objectives and Targets. 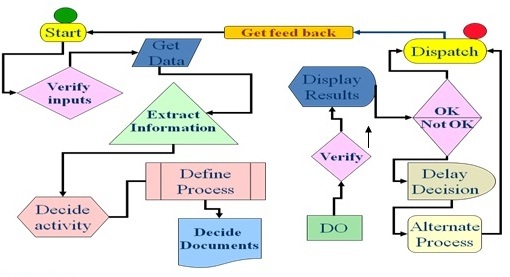 Identify the processes needed and determine their sequence and interactions. Identify resource requirement and provide as needed. Decide the competency levels of human resource required and allot people. Train people as needed and empower by assigning jobs with defined authorities and responsibility. Monitor the process and correct as required. What is expected out of that process? What are the factors contributing for the success of the process? What are the checkpoints and control points? What are value adding and cost adding elements? What are avoidable and what are essential? How much to be controlled? What data and information are required for control? Who should collect data and analyse? What should be the frequency of checks and reviews? A set of processes that transforms requirements into specified characteristics or into the specification of a product, Process or Syste. 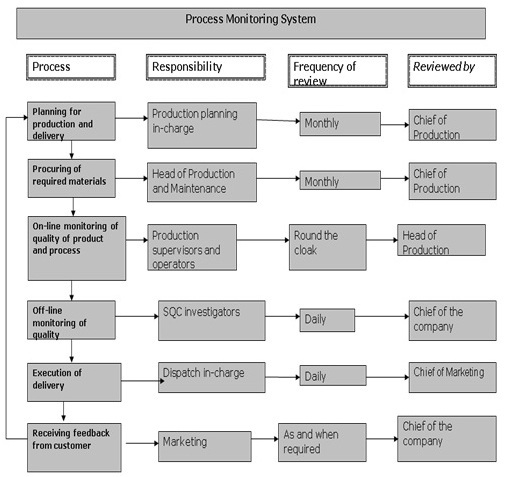 Helps in understanding the inter relation between processes and gives an idea of the acceptable criteria’s to be monitored. There are interactions between processes. Identify the controls and checks required. The control points if controlled should lead to the achievement of the result in the key result area, and finally the company objectives and goals. 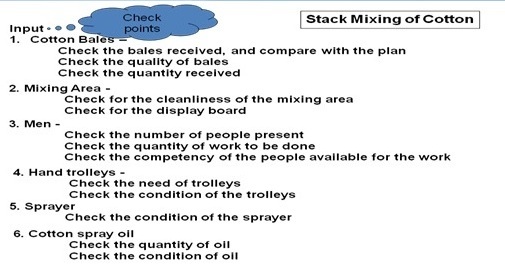 The checkpoints are process related, where as the control points are result related. It is necessary for the concerned heads of department to analyse their processes very carefully and decide on the area where they need control. Once the area to be controlled is clear, one can identify the points to be checked to verify whether the process is in control. The control points and check points are to be reviewed periodically, and modified as the systems improve. Level of adherence to process parameters. Calibration of equipments monitoring the process. Suitability of process parameter decided to get the results. Quality of Raw materials received. Competency levels of men available and men employed. 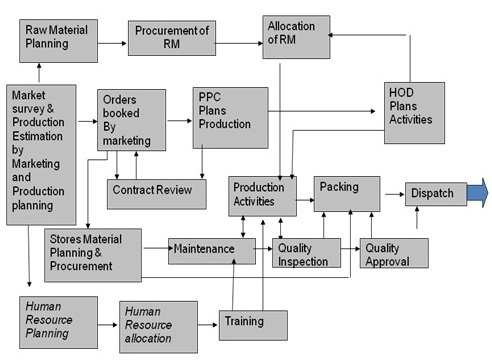 Suitability of maintenance schedules and plans for the production and quality expectation. Whether acceptance criteria are clear to all on the shop floor? Whether process parameters are as per standards specified? Rejectionsà Machine wise, Shift wise, operator wise and material wise. Whether production started in time? 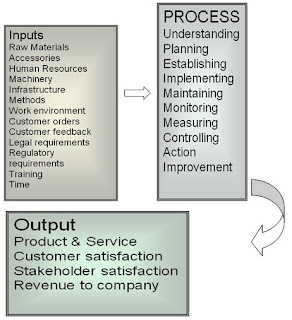 A process contains a number of operations, which finally contribute for the required out put. All the elements of a process need not add to the value of the product, but may be an essential step. Understand the specific needs of customers and work for delivering only those to them. Giving more than the needs of a customer need not satisfy the customer, but may create a problem. Anything for which customer is not ready to pay is a waste and it is a non-value adding element of the process. Identification, assessment and mitigation of risks, corrective and preventive actions, opportunities and actions for process improvement. 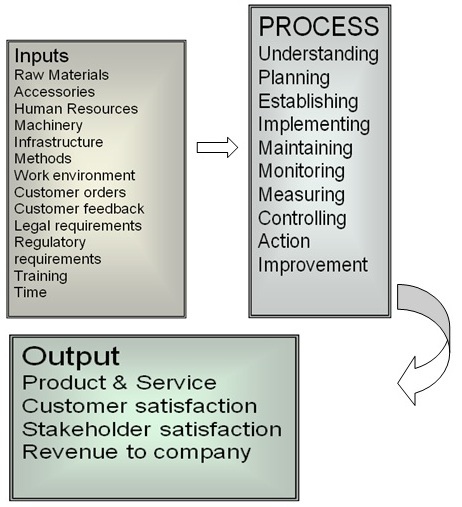 Control of changes to process and products. Input and output requirements: specifications, resources and support processes such as information, training of people, infrastructure and safety methods, marketing, etc. Activities within the processes, verification and validation of process and products, analysis of the process including dependability, monitoring the processes. Reliability and repeatability of process. Identification and prevention of potential non-conformity. Adequacy of design and development inputs and outputs. Consistency of inputs and outputs with planned objectives. For what end use the customer is asking for this material? 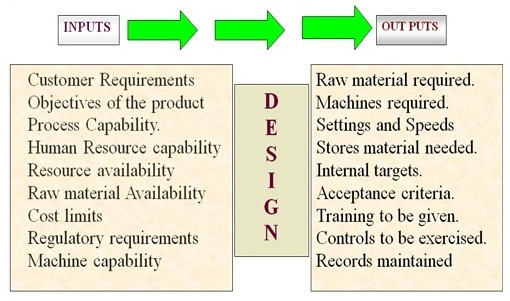 What are the critical quality requirements of the end product? What is the intended application of the product with ultimate consumer? On what machines our product is likely to work, i.e. high-speed machines, Super High speed machines, slow speed machines, Automatic machines, etc. What is the work environment at customer’s place, i.e. humidification, temperature level, dust level, skill of operatives, the management culture, etc? What are the applicable regulatory requirements for the product from the point of view of product safety, user safety, trade regulations etc? Understanding Customer needs and deciding Quality Objectives of the Product. Identification of machines to work. 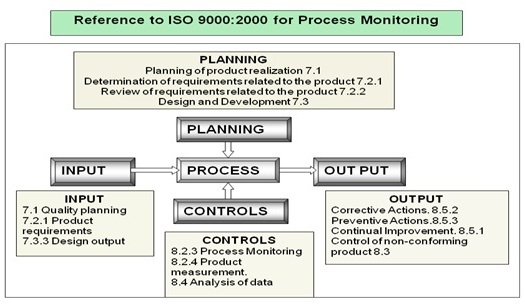 Determination of process controls and norms. Determination of Inspection and testing and Acceptance criteria. Planning the starting and ending time. Identification of persons to operate and control. Verification of results after action. 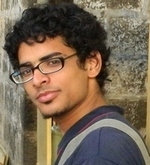 The routine checks like the speeds, production on each machine, the utilisation of machines to its planned programme, allotting the required number of persons for each operation, maintaining the process stocks for working, etc., are to be monitored online in each shift, and hence they are to be monitored by shift in-charges. The productivity variations from machine to machine and man to man, the variations in quality levels compared to targets, planning for changes in product mix and counts, etc., are to be monitored by the next seniors, like Junior spinning masters, etc. The programming of the whole section for the week or for the month, working out norms for working, preparation of procedures, work instructions, designing of formats for data collection and control, planning for purchase of spares, etc., are to be done by the concerned heads of the department. The top management should monitor the overall performance in terms of costs, sales, profits, meeting legal and regulatory requirements etc. Anything for which customer is not ready to pay is a waste. Work contents added by defects in design or specification of the product. Work content added by inefficient methods. Ineffective time due to shortcomings of the management. Ineffective time within the control of the worker. The recurring activity to increase the ability to fulfill the requirements is called as Continual Improvement. No individual or Organization can be the best in all aspects. Each one has some area, where they are the best.